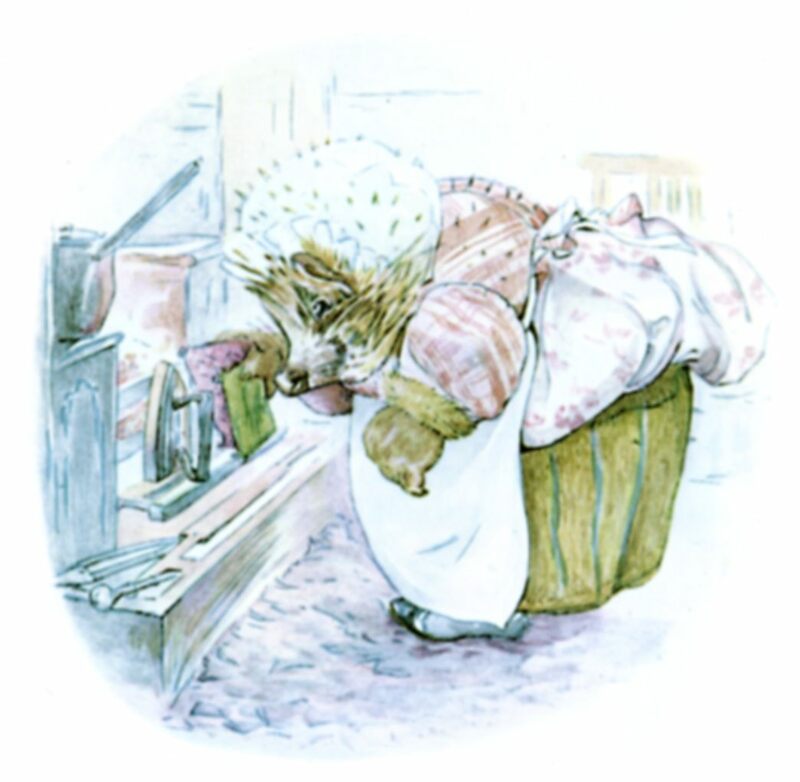 It turns out that Beatrix Potter’s birthday was yesterday, as she was born on 28 July 1866. It’s been a long time since I read anything of Potter’s, but I do remember Peter Rabbit and some of her other creations from my youth. We had a Giant Treasury of Peter Rabbit that contained several of her stories. I also recall having a mug with Peter Rabbit and his family on it. Apparently the heavy merchandising of these animal characters was started by Potter herself, who had a sense for promotion, and made the first Peter Rabbit doll herself. 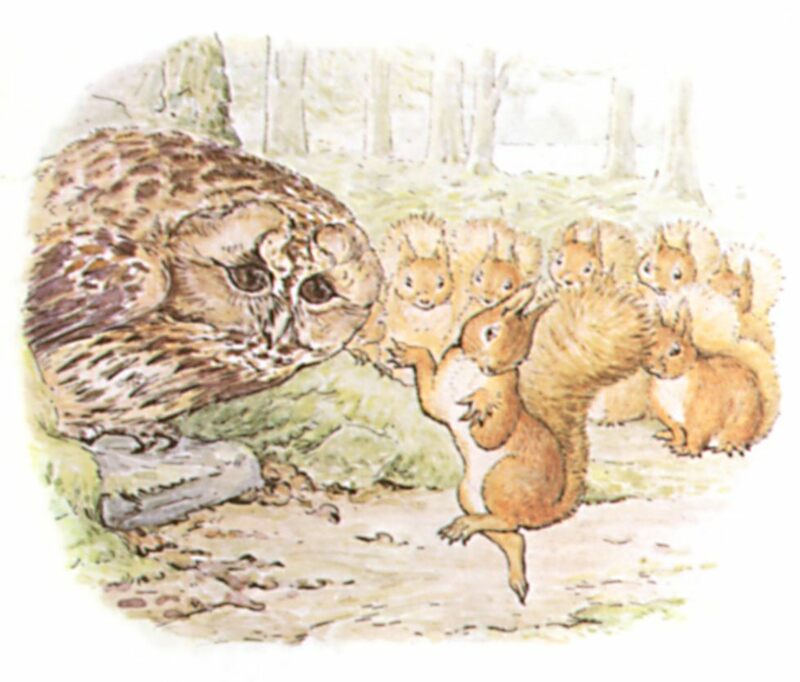 I know “The Tale of Squirrel Nutkin” was a favorite of mine, due mostly to the silly rhyming riddles that Nutkin recites. I didn’t realize at first that the answers to the riddles were in the text in italics; the idea of a riddle not phrased as a question was rather foreign to my own childhood. I wonder how Nutkin would have held up against Gollum in the riddle game. 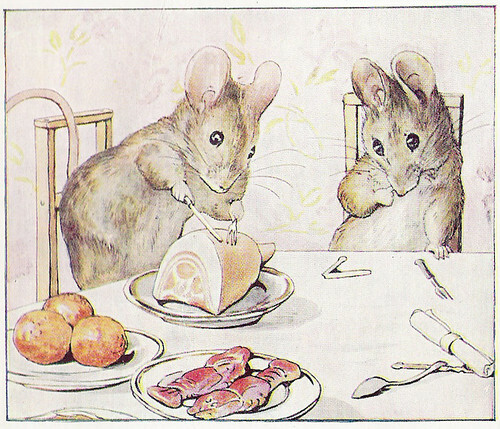 What I mostly remember, however, are the illustrations, which were often based on actual animal models. I’ve seen “The Tale of Peter Rabbit” praised for starring a rabbit who’s somewhat anthropomorphized but still ACTS like a real rabbit, as well as for giving us a protagonist who is prone to getting into mischief. This theme only intensifies in later stories, as in “The Tale of Two Bad Mice,” in which the mice Tom Thumb and Hunca Munca trash a dollhouse when they realize the food there is inedible. The Natural History of Make-Believe said quite a bit on Potter, focusing much of it on how she was influenced by the Uncle Remus stories, although even her so-called “bad” characters were never anywhere near as nasty as the various Br’ers. Anyway, this post is kind of all over the place, but I did want to acknowledge another author I remember from my youth. This entry was posted in Animals, Art, Beatrix Potter and tagged john goldthwaite, the natural history of make-believe, the tale of peter rabbit, the tale of squirrel nutkin, the tale of two bad mice. Bookmark the permalink.